Turtle Journal sampled the population of northern diamondback terrapins (Malaclemys terrapin terrapin) in Marion’s Sippican Harbor off Buzzards Bay this weekend. 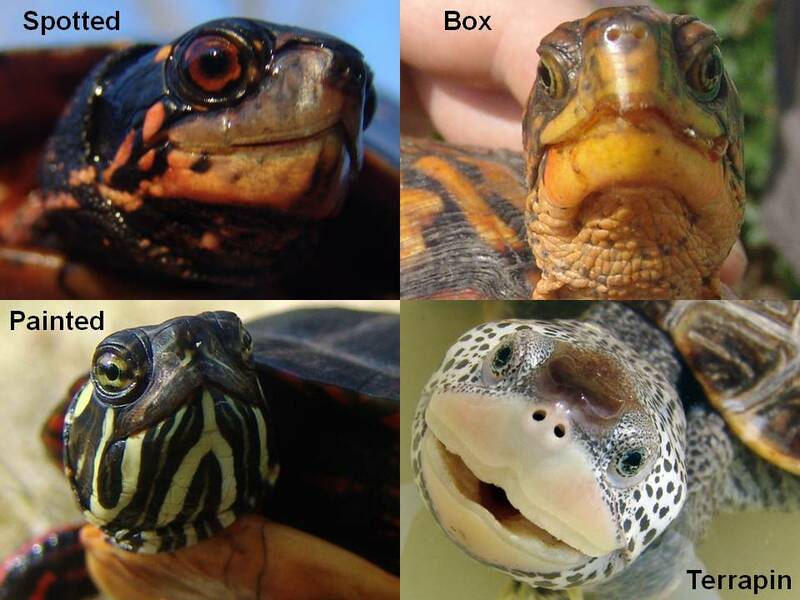 Since Marion is headquarters for the Turtle Journal team, we approach this survey each year with deep melancholy. After nearly a decade of research in Marion, each season confirms our findings that this population in Sippican Harbor is severely distressed and may be on the unalterable path toward extirpation within this estuary of Buzzards Bay. How can we assess the relative health of this population of elusive turtles and its trend without being able to physically count each and every specimen? Random sampling and the capture-mark-recapture technique. Each spring after emergence from winter brumation, during the mating aggregation and before nesting dispersal, terrapins are briefly captured by researchers. All scientific data collection occurs in the field to allow immediate return into the wild with minimal disturbance. Each specimen is measured, weighed and assessed for overall health. If not previously captured, a turtle receives a unique identification number, so that we can follow its progress throughout its life. (ASIDE: In our principal research site, we have observed individual specimens for the entire 32 year length of the study!) Pictures of its carapace (top shell), plastron (bottom shell), profile, and any anomalies are taken and included in the research database. When sampling a healthy population with signs of recovery such as Wellfleet Bay on the Outer Cape, where effective long-term conservation measures have turned around a formerly distressed system, the percentage of recaptures in comparison to newly captured turtles remains well under 50% … even after 30 years of sustained research. In fact, with the new conservation measures initiated in 2000, recapture rates dropped significantly beginning in 2007 indicating a rebounding population. Unfortunately in Sippican Harbor, the recapture rates has been in the high 90% since the initial sampling nearly a decade ago and remain tragically high. Of the six individuals captured this weekend, for instance, five were recaptures with long histories since the beginning of the Marion research effort. Why are Sippican terrapins in trouble? The simplest answer is that humans have transformed the natural estuarine habitat of Sippican Harbor in ways that have been extremely detrimental to terrapins and the entire marine ecosystem. 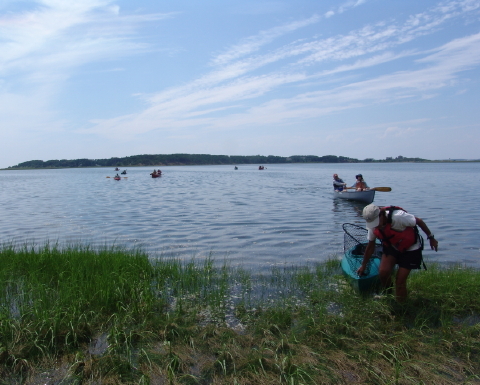 Salt marshes have been fragmented and filled in; marsh grasses mowed down & plucked out to increase bathing spots. Lush suburban lawns and playing fields have been extended to the waterline. Coasts have been armored in sea walls, and dirt roads and pathways have been asphalted or graveled. The coastline is sand-starved with protective barrier beaches eroding away. 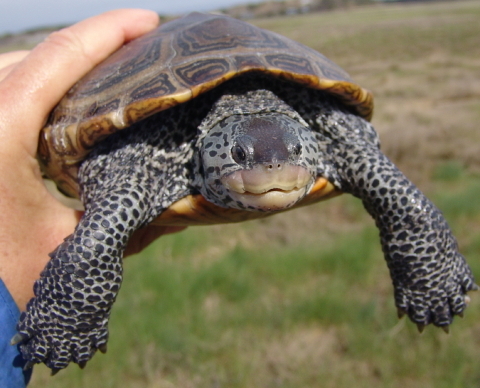 For terrapins, they have lost upland nesting, nursery habitat in salt marshes, and foraging areas. Human construction has intruded right into their once secluded mating aggregation. In the end, the numbers tell the tale. Very few recruits enter the system, and as the small existing population of turtles yields over time to human disturbance and old age, Sippican Harbor will be purged of this bellwether species. Turtle Journal brought its multimedia Turtles Gone Wild presentation to the Lakeville Historical Society on Wednesday night. 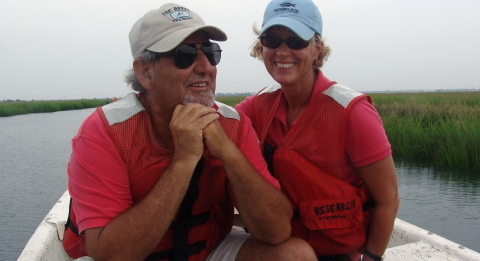 To be certain that Don Lewis and Sue Wieber Nourse got all the facts right, a cadre of hard-shelled guests came along to keep the Turtle Journal team on the straight and narrow. A female and male pair of diamondback terrapins took the night off from romance at the Outer Cape mating aggregation. 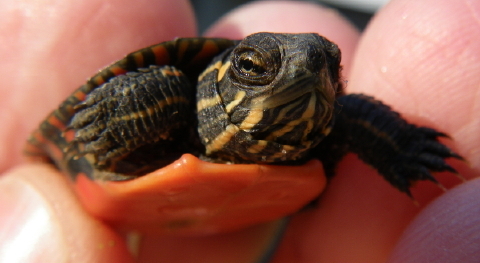 A female spotted turtle came along from a SouthCoast bog where she has been waiting for her turn to nest. And a two year old juvenile painted turtle thought it would be fun to show off his stuff for two legged critters. While the SRO (standing room only) crowd endured Don’s turtle stories, they truly lit up when Sue introduced them to our reptilian guests. 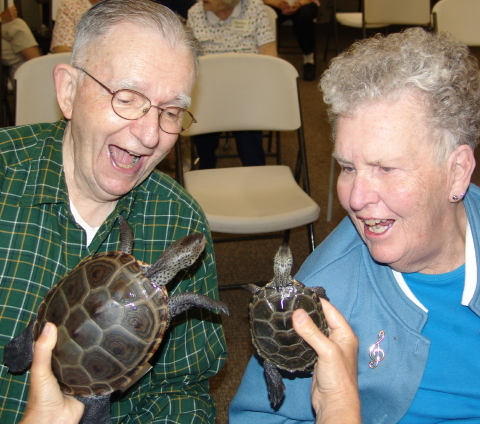 Of all the specimens on hand, none wowed the audience more than the diamondback terrapin pair. 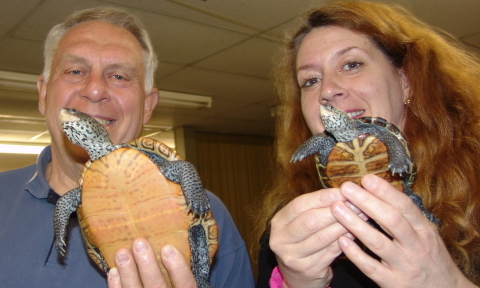 As is the way with terrapins, the female is significantly larger than her male companion. At the end of the evening, all went off into an exquisite May evening knowing a lot more about turtles and their history in Massachusetts, and smiling at the comical antics of these warm-hearted, cold-blooded creatures. Look Down, Cape Codders, and Save a Local Reptile! It’s that time again. In the next six weeks, local Cape Cod turtles will leave the quiet safety of woods, ponds and estuaries to trek into the noisy bustle of civilization to deposit eggs for the next generation of hard-shelled reptiles. They need our help to escape the hazards of modern life as intrepid turtles fearlessly venture across Route 6, Route 28, neighborhood streets and dirt roadways to reach nesting sites. Local turtles spent the long, cold winter burrowed deeply underground or buried under layers of ooze at the bottom of ponds, brooks and estuaries. They woke in April as temperatures rose, and after a quick warm-up basking in spring sunshine, they turned their thoughts to love and courtship. Now eggs are ready for in-ground incubation, and the time has come for females to trek to nesting sites to deposit the next generation of Cape Cod turtles. Such epic journeys entail considerable risk. Impelled by immutable laws of Nature stronger than their instinct for personal survival, turtles must reach viable nesting grounds across near impossible obstacles that sprawling civilization has lain before them. With Sisyphean persistence turtles tackle highway crossings, over and over again, until they successfully reach the other side or die in the process. For turtles there is no Plan B. Restrained by neither angst nor doubt, they soldier on as though one of Tennyson’s heroic six hundred. The nesting season usually kicks off with painted turtles that wake early in protected ponds, followed by spotted turtles, snappers, box turtles and diamondback terrapins. No exception this year, the Turtle Journal team found a depredated painted turtle nest on May 17th, and Wellfleet Bay Wildlife Sanctuary sighted a painted turtle on a nesting run on Friday, May 20th. So far this season, we haven’t witnessed longer cross roadway treks, but it’s just a matter of days until warmer weather arrives as predicted for later this week. Humans to the rescue These asphalt turtle journeys are extremely dangerous. 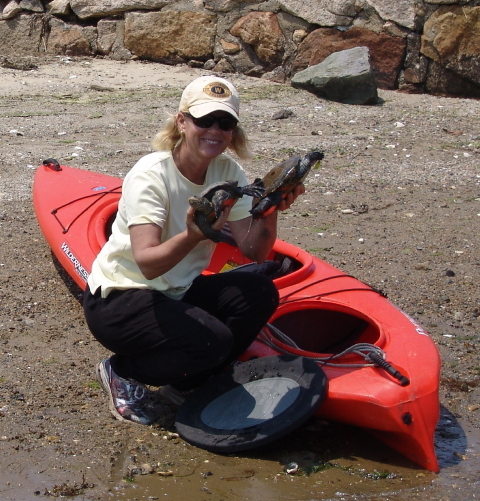 Yet, especially on Cape Cod, residents and visitors trade a little time and convenience for turtle survival. Each year they save hundreds of mother turtles by helping them safely execute this lethal passage. People know to help them cross the highway in the direction they’re headed, and never to push them back to the shoulder from whence they came. It only postpones the inevitable. A while back, a very large expectant snapping turtle decided to cross Route 6 in Truro near Pamet Road from east to west. As she edged onto the highway on a gorgeous early June morning, traffic screeched to a halt. A responding police officer carefully tugged her back to the shoulder and down the east bank. (One must be extremely careful with a determined 60-pound snapper, if one wishes to disengage with the same number of fingertips one began the task.) Of course, 30 minutes later the traffic was jammed again when this relentless lady re-climbed the bank and began one more time to dodge cars. Luckily, the Truro dispatcher reached Turtle Journal’s hotline (508-274-5108) who managed to entice the snapper into a bucket and raced her across Route 6 to the west side. One more turtle saved with little inconvenience to tourists or snapper. No one should risk life and limb, and children should only get involved with adult supervision, but a moment of human kindness can erase a ton of human negligence in the way we’ve scarred and fragmented the environment. It’s good for the turtles, good for humanity, and good for the soul. If you’d like to learn more about Cape Cod turtles, Mass Audubon is offering a hands-on Turtles of Outer Cape field school from 22 thru 25 June at Wellfleet Bay Wildlife Sanctuary. The Turtle Journal Team, Don Lewis and Sue Wieber Nourse; renowned Cape Cod naturalist and turtle expert Bob Prescott; and author Dr. Barbara Brenessel will lead field adventures to discover the secrets of these hard-shelled reptiles and to save two rare and protected species of turtles on the Outer Cape: Northern Diamondback Terrapins and Eastern Box Turtles. For more information contact Mass Audubon’s Melissa Lowe at 508-349-2615. While an optimistic attitude is always the best policy, we’re hopeful that for the next six weeks we can encourage you to look down rather than up. 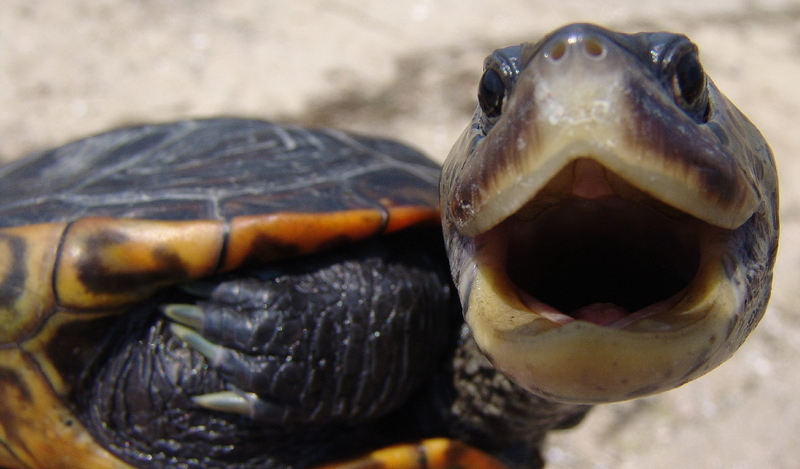 If you spot a turtle at risk, take a moment to help out. If the situation is too dicey, call the Turtle Journal hotline at 508-274-5108. If you see a turtle nesting and you’d like advice on how to protect those eggs from predators, call the hotline. 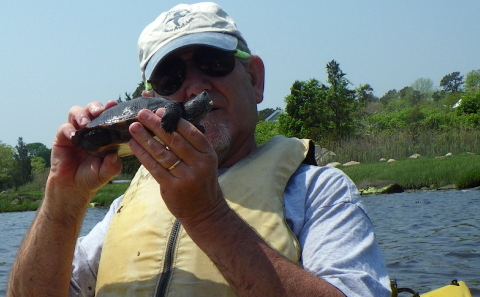 To learn more about turtles and to follow the ongoing saga of nature on Cape Cod, visit Turtle Journal at www.turtlejournal.com. Beyond the powerful scientific results that such a continuous long-term study of a protected species provides, Turtle Journal freely admits that we simply enjoy the stories that these terrapins tell as each capture in succession fills in details of their lives, of their histories and of their survival. For instance, Terrapin #1900 was captured by Sue Wieber Nourse on Friday. 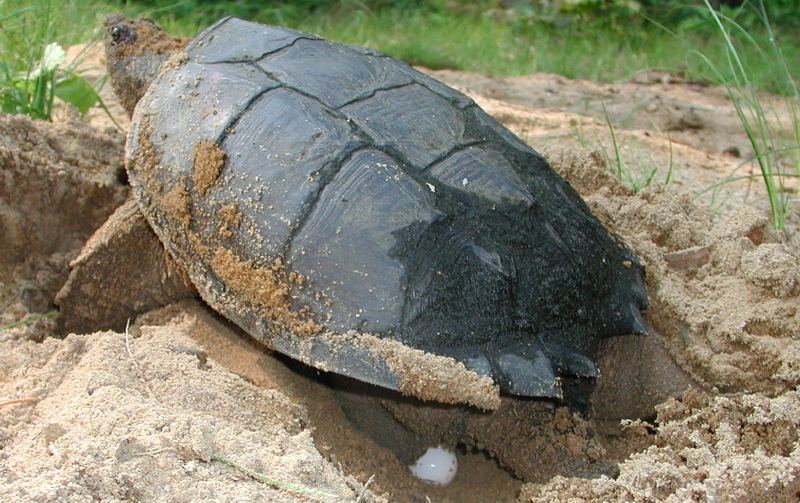 Don Lewis had originally marked this mature female during a nesting run on Lieutenant Island in June 2003. 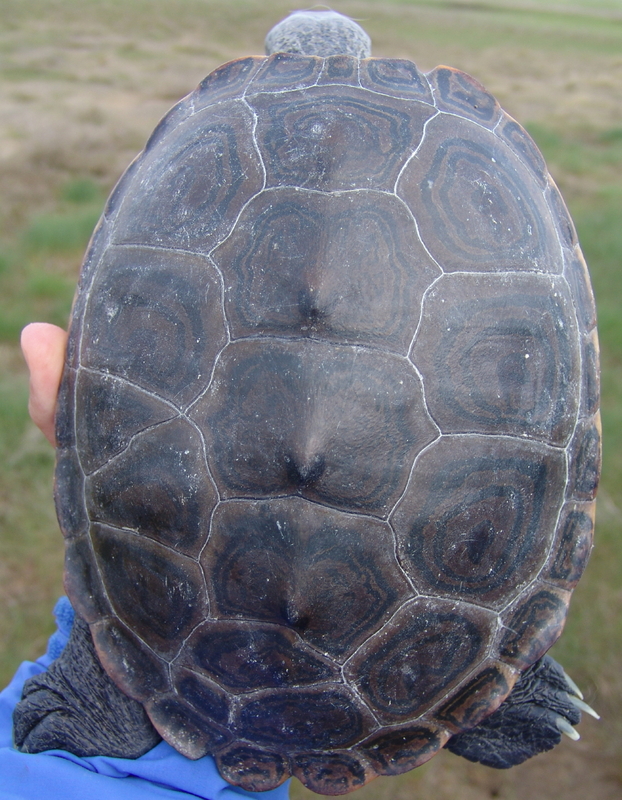 As you can see from the photograph above, Terrapin #1900 is easily recognizable by the unique scute anomalies on her carapace. Like the movie character in The Legend of 1900, our #1900 never seems to leave Lieutenant Island and its immediate vicinity. She comes ashore twice each year, in June and July, to lay nests on the south side of Lieutenant Island. When she’s not on nesting runs, #1900 remains in the tidal flats south of Lieutenant Island for brumation, foraging and mating. She’s a captive of her local environment akin to her Legend of 1900 analog. 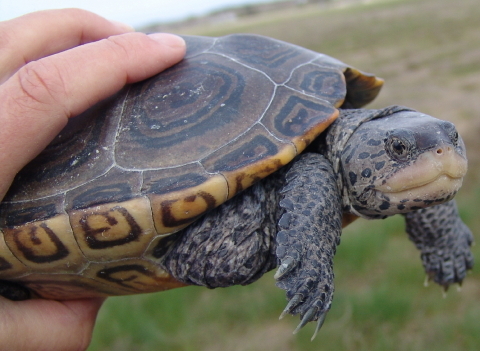 As Wellfleet turtles go, Terrapin #1900 is the exception rather than the rule. Detailed migration patterns revealed over 32 years of records demonstrate how diamondbacks crisscross Wellfleet Bay to exploit various aspects of this rich estuary system for foraging, mating, nesting and brumating. 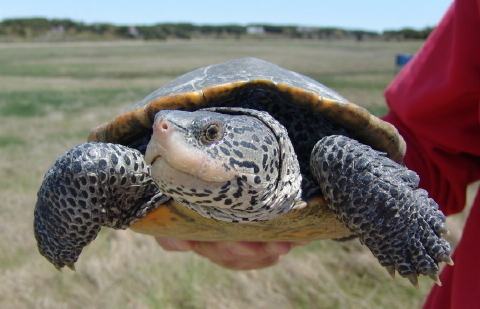 Four other terrapins that Sue captured on the 13th revealed stories about where they’ve been and how they use the estuaries, the uplands, the tidal flats and the salt marshes of Wellfleet Bay in order to sustain the strongest population of this threatened species in Massachusetts. As has been revealed often in the pages of Turtle Journal, these individual stories weave together an epic tale of how terrapins migrate throughout the bay’s estuaries to exploit the full bounty of this northernmost habitat in the world for diamondbacks. After scientific processing and epic storytelling, these Wellfleet legends head back into Fresh Brook Run led by #1900 for a little more springtime cavorting. With any luck, we’ll see several of them again when nesting seasoon begins in four more weeks. Through the magic of digital media, Turtle Journal’s Don Lewis and Sue Wieber Nourse will transform the Lakeville United Church of Christ into the wild world of turtles for kids from four to 104 to experience the excitment of adventure and discovery. We’ll cast away the everyday world, climb inside a dazzling sound and light show, and unleash our inner explorer. We’ll watch as turtles wake from winter slumber, bask in bright spring sunshine and turn their thoughts to creating the next generation of reptiles. We’ll hide in camouflage as females trek across impossible obstacles to reach nesting sites and deposit eggs representing the future of threatened turtles in Massachusetts. We’ll fast forward as hatchling emerge from the sand to take their first breath of live as they scramble for safety. We’ll uncover secrets about what makes these shelled critters such a wonderful bellwether species of our natural world. Turtles have survived the dinosaurs, survived the asteroid that killed the dinosaurs, survived ice ages and intervening global warming, out-lived saber tooth tigers and mammoths … and have crawled the earth for 300 million years. As their populations tumble, so goes the quality of the world around us. 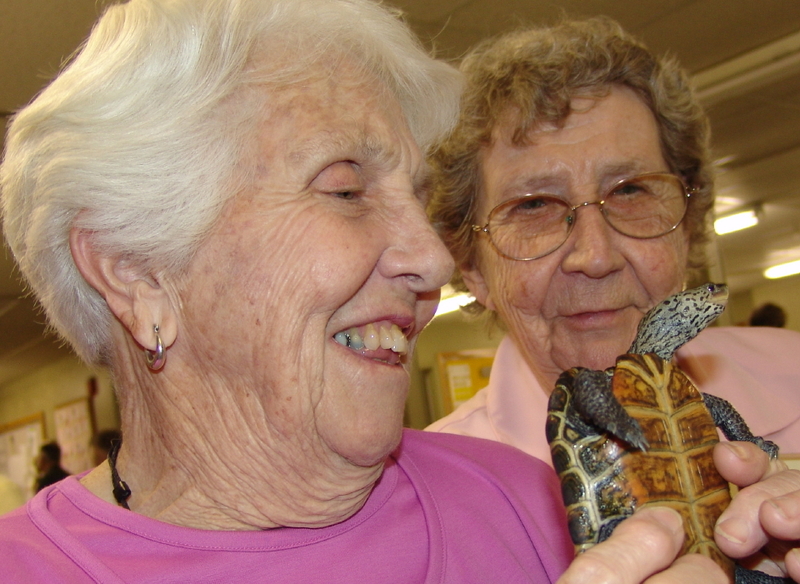 As turtles thrive, we see positive advances in the richness of our own lives, too. You are currently browsing the Turtle Journal blog archives for May, 2011.